Canadians who opt for chicken sandwiches while dining at fast food restaurants may find a Marketplace analysis of what they contain a little hard to swallow. If you're one of many Canadians who opt for chicken sandwiches at your favourite fast food restaurant, you may find the results of a CBC Marketplace investigation into what's in the meat a little hard to swallow. 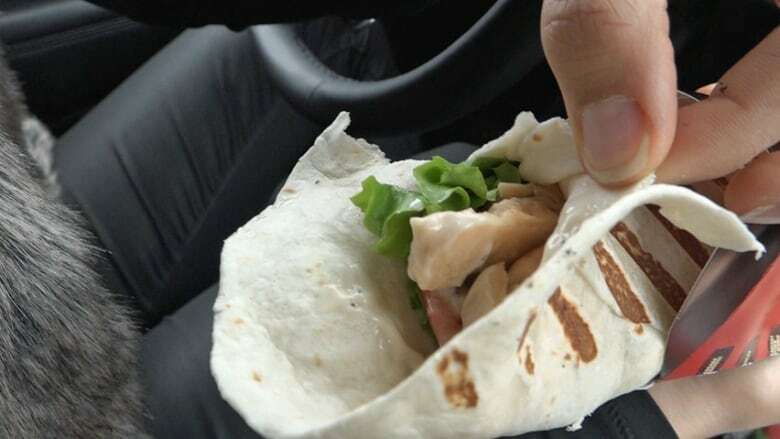 A DNA analysis of the poultry in several popular grilled chicken sandwiches and wraps found at least one fast food restaurant isn't serving up nearly as much of the key ingredient as people may think. In the case of two popular Subway sandwiches, the chicken was found to contain only about half chicken DNA. QUIZ: Ice cream or frozen dessert? What are you eating? Will Mahood, a loyal customer who considered Subway chicken sandwiches a lunchtime staple, was alarmed by the findings. To Mahood, messages from fast food companies can make it sound like "you're taking it straight from a farm and it's just a fresh piece of meat." 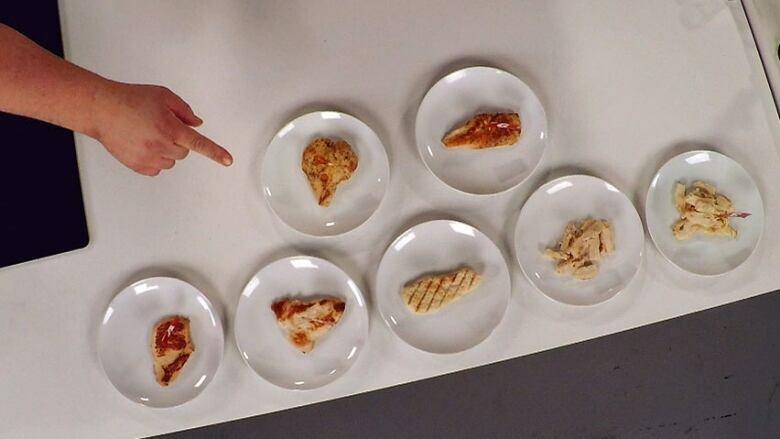 DNA researcher Matt Harnden at Trent University's Wildlife Forensic DNA Laboratory tested the poultry in six popular chicken sandwiches. An unadulterated piece of chicken from the store should come in at 100 per cent chicken DNA. 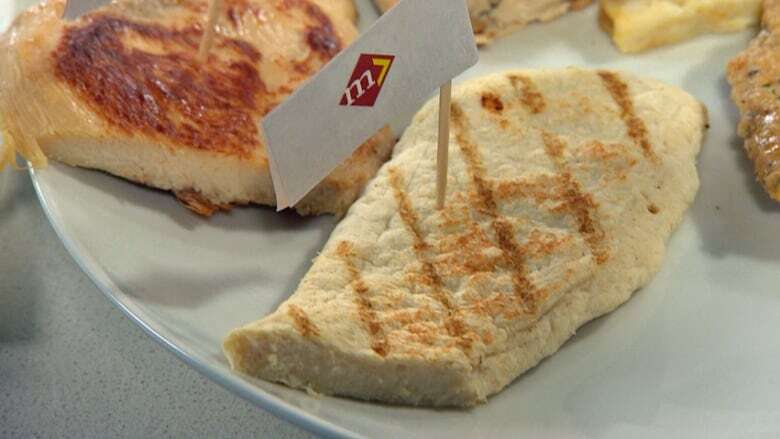 Seasoning, marinating or processing meat would bring that number down, so fast food samples seasoned for taste wouldn't be expected to hit that 100 per cent target. NOTE: The tests were on the meat samples alone, without sauces or condiments. In the first round of tests, the lab tested two samples of five of the meat products, and one sample of the Subway strips. From each of those samples, the researchers isolated three smaller samples and tested each of those. They were all DNA tested and the score was then averaged for each sandwich. Most of the scores were "very close" to 100 per cent chicken DNA, Harnden says. Subway's results were such an outlier that the team decided to test them again, biopsying five new oven roasted chicken pieces, and five new orders of chicken strips. "That's misrepresentation," Irena Valenta, a Toronto resident who participated in a Marketplace taste test, said after seeing the test results. Subway said in a statement that it disagrees with the test results. "Our recipe calls for one per cent or less of soy protein in our chicken products." On the whole, Marketplace's testing revealed that once the ingredients are factored in, the fast food chicken had about a quarter less protein than you would get in its home-cooked equivalent. And overall, the sodium levels were between seven and 10 times what they would be in a piece of unadulterated chicken. Ben Bohrer, a food scientist at the University of Guelph, doesn't know exactly how the chicken products Marketplace tested are made, but he's very familiar with what the fast food industry calls "restructured products". Restructured products are essentially smaller pieces of meat or ground meat, bound together with other ingredients to make them last longer, taste better and, as Bohrer puts it, "add value" — restaurant speak for cheaper. The sandwiches tested contain a combined total of about 50 ingredients in the chicken alone, each with an average of 16 ingredients. The ingredients run the gamut from things you would find in your home such as honey and onion powder to industrial ingredients — all of which, Bohrer insists, are safe and government approved for human consumption. McDonald's, A&W and Wendy's wouldn't break down exactly what ingredients are used in what proportions, citing proprietary information. Tim Hortons had no comment and directed Marketplace to their website. Nutritionist and registered dietitian Christy Brissette notes that most products in that alphabet soup ingredient list are simply variants on salt or sugar, the latter of which can elevate the carbohydrate level of a chicken breast to well above where it should be: zero per cent. Before they saw the test results, both Valenta and Mahood said they chose chicken because they thought they were making a healthier choice — "the chicken is supposed to be the healthier type of meat," as Valenta put it. But Brissette says it's important for consumers to not allow themselves to buy into the "halo" of health around such products. "People think they're doing themselves a favour and making themselves a healthy choice," she says. "But from a sodium perspective you might as well eat a big portion of poutine." Do we still need 3 square meals a day or is all-day breakfast the new normal?